The number of those killed in the Ukrainian violence has risen to 77, the country’s Health Ministry has said. 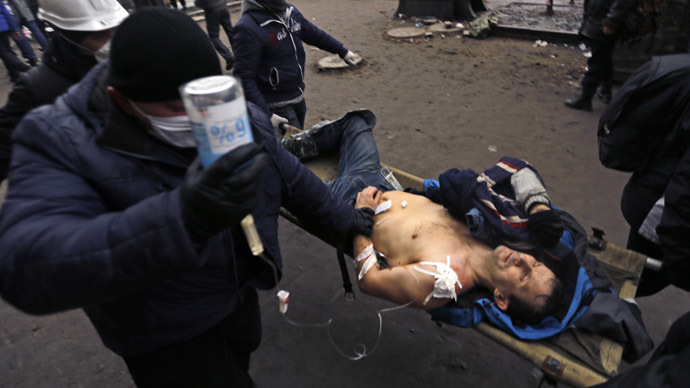 Doctors working on Kiev’s Independence Square, however, claimed that as many as 70 people were killed on the rioters’ side alone on Thursday. 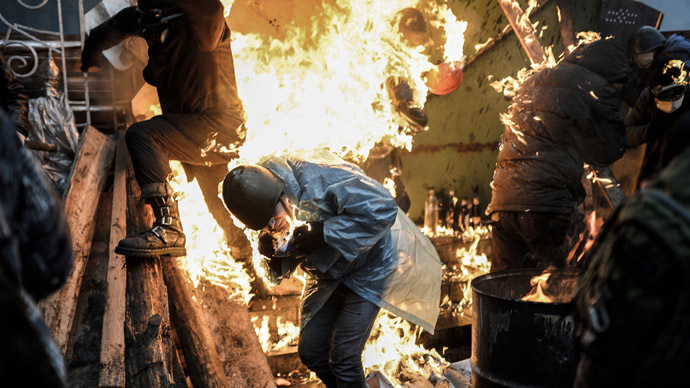 The death toll in the most violent wave of clashes between the rioters and the police in Kiev is likely to increase, as there are conflicting figures coming from the Health Department, city officials and the opposition. As many as 570 people have been injured, according to official estimates. The surge in the number of victims comes as both armed rioters and the police are now using live ammunition in clashes. Many of the protesters and police officers killed or injured since Tuesday sustained gunshot wounds. Police have officially been allowed to use firearms in accordance with the law by an order of the Ukrainian Interior Minister. At the same time, the Ukrainian parliament voted against the anti-terrorism measures in the country, with 236 deputies casting their votes. The decision calls for a ceasefire and return of all security forces to their permanent deployment areas. The resolution also prohibits the use of firearms in certain situations and bans the blocking of public transport. Violence escalated on Tuesday after a group of radicals taking part in a “peaceful march” of the opposition attempted to storm the building of the Ukrainian parliament (Verkhovna Rada). They were repelled by police cordons. The move came despite the agreement on amnesty finally reached between the government and the opposition. The rioters then stormed and looted the nearby unprotected office of the ruling Party of Regions, also setting it on fire. One office worker was later found dead in the devastated building, with reports saying he died from smoke inhalation. The clashes soon grew bloody, with footage showing masked rioters firing rifles and pistols at the police in central Kiev and reports describing dead protesters with gunshot wounds. As the situation increasingly spiraled out of control, both the Ukrainian government and the opposition blamed each other. While the government demanded that the riots stop and the armed protesters lay down their weapons, speakers on Independence Square (Maidan) demanded that police leave central Kiev. Despite the truce agreed between President Viktor Yanukovich and the leaders of the opposition, the violence continued as armed rioters did not heed the words coming from Maidan. 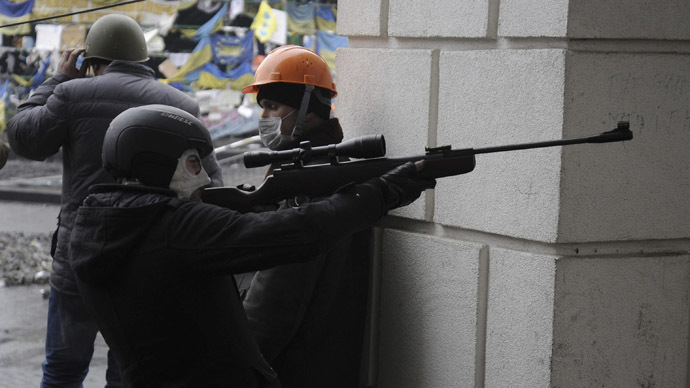 Until this week, snipers shooting people in central Kiev have been little more than unsupported hearsay. 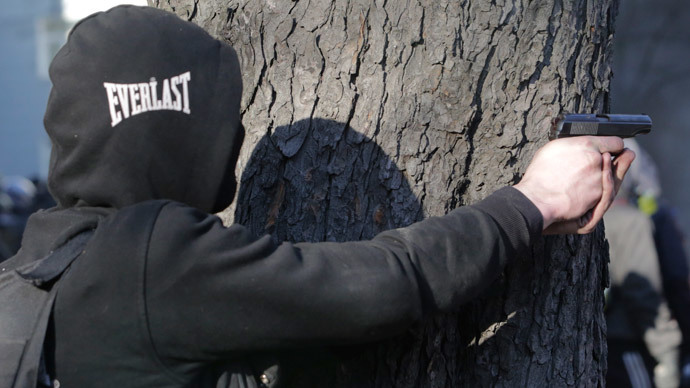 But on Thursday, both security forces and rioters were filmed stalking the streets with rifles. RT’s crew narrowly avoided being shot by sniper fire while standing next to a window. 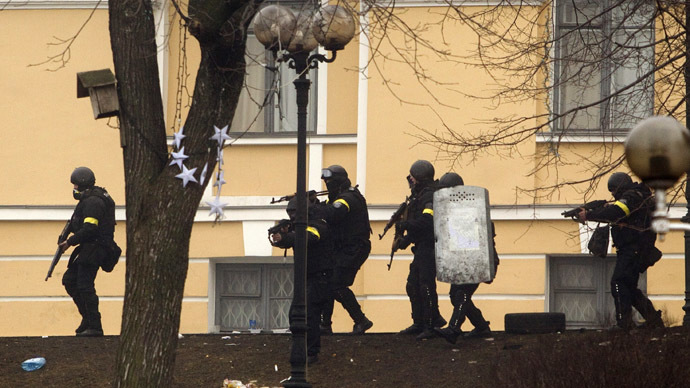 RT’s Aleksey Yaroshevsky reported that unidentified snipers were firing from buildings all around Independence Square. Correspondent Egor Piskunov and his camera crew were also caught in the crossfire as they tried to film Independence Square from the Hotel Ukraine. One of the bullets grazed the bulletproof vest of journalist Danil Asimov as he stood by the window on the 14th floor of the Kiev hotel. Armed rioters then seized the hotel, using its windows to fire at police. 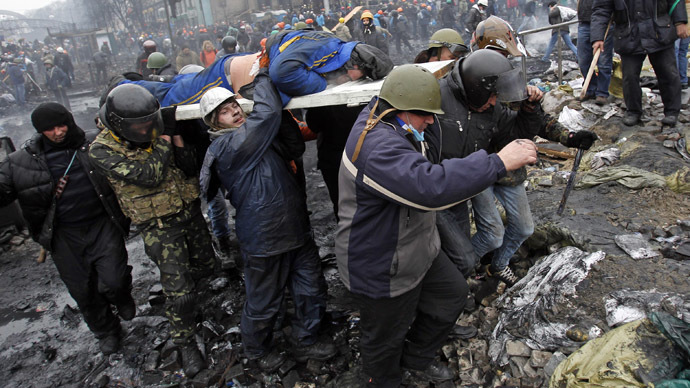 At least 13 officers have been killed and 130 hospitalized with gunshot wounds, the Ukrainian Interior Ministry said. In all, 565 law enforcers have sought medical help since Tuesday, and 410 of those were taken to hospital.